Rotational molding, also known as roto moulding, roto casting or spin casting, is a molding process for creating many kinds of mostly hollow items. More than 80% of all the material used is from the polyethylene family. 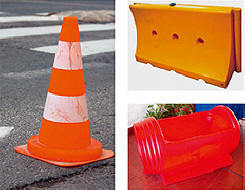 Typical products created in a rotational molding process include large volume water tanks, children playgrounds, barricades and traffic cones. A heated hollow mould is filled with a charge or shot weight of material, it is then slowly rotated causing the softened material to disperse and stick to the walls of the mould. In order to maintain even thickness throughout the part, the mould continues to rotate at all times during the heating phase and to avoid sagging or deformation also during the cooling phase. Due to the large volume of most parts a two stage shredder granulator combination is commonly used when recycling roto moulded products such as water tanks. In this case the ZIS shredders with their increased hopper volume are very well suited. 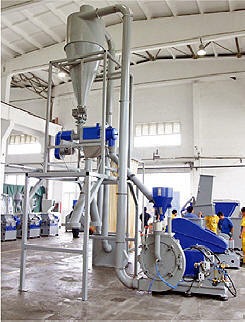 Granulators of the GSH, GSE and GSC series can be used as a single step solution or second stage grinder as well. 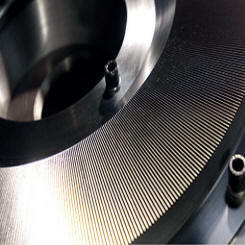 The pulverizers of the PM series play a very important role in the roto moulding process. Firstly they are used to create the necessary powder from the virgin Polyethylene pellets. Here a screening machine is used to create the right size, distribution and flow rate needed in the rotational molding process. Further they can be used to create powder from regrind of recycled parts to be reused in the roto moulding process.